Black and white photograph of Norman and Dario Mascioli, Timmins, ON, late 1920s. 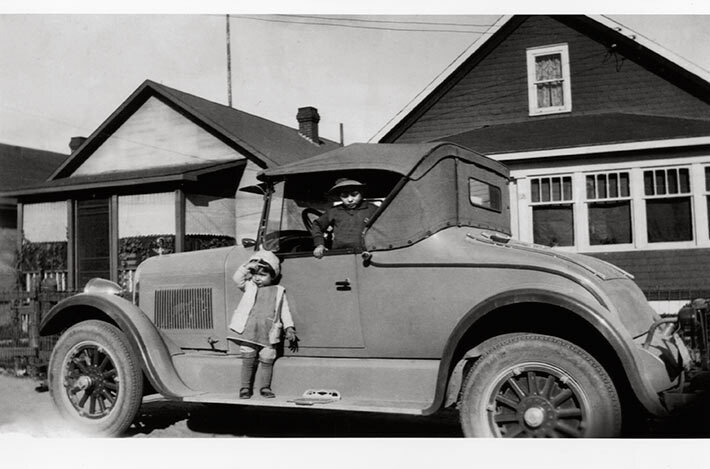 The children are posed in a car parked on an unidentified residential street. It is unclear if this is the Moneta neighbourhood in Timmins, where the family resided. Two bungalow homes are visible in the background. The two brothers are the children of Antonio and Ninetta Mascioli. Dario passed away as a young boy at age 7; he is the boy inside the vehicle. The children's father, Antonio Mascioli, was arrested on June 10, 1940 and interned as a threat to the Canadian state.